Though the dolphin die-off has be attributed to a virus, the cause of the disease remains a mystery. Since late last year, four or five dolphin carcasses have beached in Brazil each day. Scientists have confirmed that a virus is to blame, but the mortalities still have conservationists baffled. The Associated Press reports more than 130 gray dolphins have washed up in the Bay of Sepetiba, a coastal area about 45 miles west of Rio de Janeiro, since late November. Another 40 dolphin carcasses were found on the neighboring island of Ilha Grande. Combined, that’s more than 20 percent of the area’s known dolphin population, which, at an estimated 800, may be the highest concentration of the species in the world. Local conservation NGOs like the Boto Cinza Institute and SOS Botos have examined the carcasses’ skin, blood, and bones under the suspicion that a bacterium or virus was to blame. 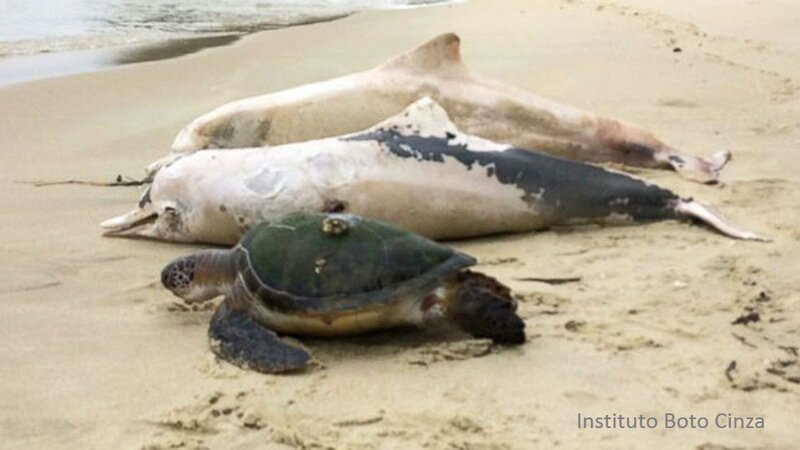 The School of Oceanography at the State University of Rio de Janeiro confirmed that cetacean morbillivirus, which can infect dolphins, porpoises, and whales, killed the marine mammals. But scientists aren’t sure what caused the outbreak, or how long it might last. They are still trying to determine other reasons for the dolphin die-off. The virus attacks the animals’ immune systems, resulting in skin lesions, pneumonia, and different types of infections. Boto Cinza Institute chief coordinator Leonardo Flach told StoryTrender in early January that if a pathogen-related disease was diagnosed, 70 to 80 percent of the population could die. Cetacean mirbillivirus can spread between animals through inhalation or contact. Often living in pods of up to 200 individuals, dolphins have close relationships, and a contagious illness could be devastating.